Montissole graduates Community Academy of Science and Health in Dorchester on June 9. She has a summer full of events planned as a member of the Unified Team starting with a home-and-home series with the Chicago Fire’s Unified Team on June 17 at Gillette Stadium and on August 5 at Toyota Park. The Unified Team was created by New England Revolution and Special Olympics Massachusetts to promote an environment of friendly competition and inclusion. 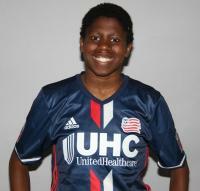 New England Revolution has been in partnership with Special Olympics Massachusetts for the past ten years. Montissol will be competing and working hard this summer, but can look forward to the third Annual Bowl for a Goal – the New England Revolution Charitable Foundation’s bowling event presented by Arbella Insurance, which is set to take place on Wed., July 26 at Splitsville Luxury Lanes in Patriot Place. The event brings together coaches, players, and fans of New England Revolution. Last year, the event raised over $75,000 for Special Olympic Massachusetts helping to provide year-round sports training, athletic competitions, and programming for more than 13,000 athletes with intellectual disabilities annually. This summer kickoff event typically includes raffles, trivia, and a silent auction to benefit Special Olympics Massachusetts. The 3rd Annual Bowl for a Goal’s time is yet to be determined, but updates or changes to the event can be found here: https://www.revolutionsoccer.net/community/bowl-for-a-goal.